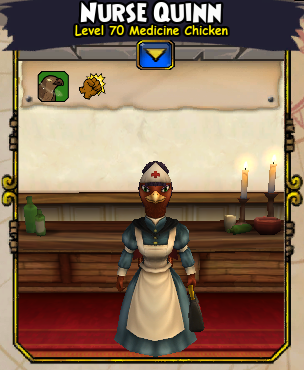 Kingsisle doesn’t want you to know about this companion. For years, they’ve planted agents within the Pirate101 community. These agents have been instructed to convince everyone that Nurse Quinn is a terrible companion. The talking points are boring and tired. “She’s a melee witchdoctor with terrible base accuracy and bad epic talent choices”, “She has no guaranteed attacks”, “Her only power is a weak, single-target heal” Cast these ridiculous critiques aside. I’m brave enough to speak the truths that no one else has dared to say. Nurse Quinn is the best companion in the game, and it’s not even close. Source: Swashbucklers obtain Nurse Quinn from the side quest, Saving Corporal Sanders in Cool Ranch. Having this companion on their roster alone makes Swashbucklers the most powerful class in the game. If it wasn’t for the agents that KI instructed to bad mouth Nurse Quinn, she would be even more deserving of a ban in PvP than Doom Mojo. The swashbuckler class would just be too powerful. Other classes can (and should) purchase her for 4495 Crowns after completing the same side quest. Most companions can be categorized into groups such as “offensive,” “defensive,” or “support.” Nurse Quinn transcends all of these foolish boundaries. She is everything at once, but at the same time, she is nothing at all. You cannot force her into a category or role like you could with feeble companions like Peter Quint, Old Scratch, and Nausica. However, if I had to categorize her, I would describe her as the living incarnation of Victory itself. As you may have seen, Nurse Quinn comes with First Strike and Rouse trained. I assure you, this combination of powers and talents is impossible to find as default epics on another companion. 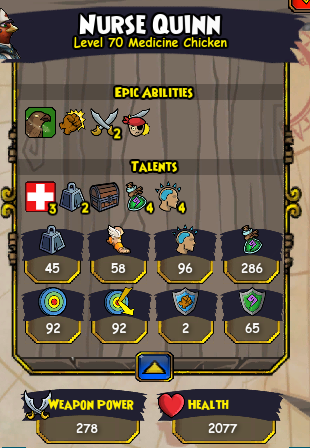 Kingsisle knew how vastly overpowered this combo was. Thus, they embarked on a smear campaign, persuading the community that Nurse Quinn was the meme to end all memes. She was “useless,” “weak,” and “a joke.” Any free thinker should be able to see beyond this ruse and appreciate Nurse Quinn’s raw power. 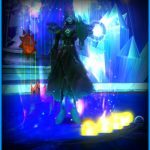 We at Final Bastion have featured other companions with trained heals. But was that trained heal a Rouse, the original, the most primal of heals? No. If you truly want to tap in to primal healing power, you must use Rouse. Consequently, this Rouse is beyond powerful. Before you give any talents to Nurse Quinn, this Rouse heals for a whopping 503 points of health. How can you take advantage of this in a match? Well, if you or a teammate has taken damage, this Rouse can restore the health you lost. However, a companion as powerful as Nurse Quinn shouldn’t be healing mere mortals. This Rouse should instead be saved for the rare chance that Nurse Quinn herself takes damage. Since she is always the most powerful unit on the field, keeping her alive ensures victory. What about First Strike? Being able to strike before her opponents will elicit such a potent reaction, that Nurse Quinn’s foes will often run away in fear, unable to gaze this chicken in the eyes. Furthermore, first strike can land a killing blow on a wounded unit, saving you and your team from taking damage. To be honest, there’s really no need to train Nurse Quinn at all. Not training her will give your competition a fighting chance. However, if you’re a ruthless competitor like me, I’ll share how you should train this warrior-deity for battle. Flanking 2 – Should you position your units properly, Flanking 2 will enable Nurse Quinn to hit 3 different targets before attacking her intended target for the round. 4 attacks on 4 different units is amazingly powerful, and it should be clear why I selected this epic talent. Scrapper 3 – Nurse Quinn is (obviously) a Nurse. It would be completely ridiculous if a Nurse couldn’t heal herself as effectively as possible. 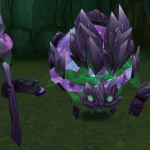 People might say that this talent does nothing in PvP. To be frank, they’re just naysayers. Ignore them. Strength 2 – Gotta make her swole, am I right? Scrapper 1 – This is another talent that the naysayers will call “useless.” Is being able to find a piece of super-powerful stats gear more effectively “useless”? Checkmate. Not only are Nurse Quinn’s talents useful for making herself more powerful, she shares the wealth by helping your pirate find the stat gear that you so desperately crave. It’s shocking I even need to write this section of the guide. Every class can use Nurse Quinn effectively. I’ll go even further, every class should use Nurse Quinn. If I’m being completely honest, every class must use Nurse Quinn should they ever want to be optimally competitive. As for in match strategy, that should be simple. Triggering flanking is easy. Put one of your other melee companions adjacent to an enemy. Have Nurse Quinn walk through the tile directly across from the first companion. Flanking will trigger, and you’ll get free damage just for having Nurse Quinn walk a little bit. I hope this piece shed some light on the most powerful unit that has ever graced the Brawlin’ Hall, Nurse Quinn. Even though Kingsisle has attempted to hide her awe-inspiring power from the public’s eyes, it was inevitable that someone realized what this chicken could do. If I go missing after this piece is published, you know why. They couldn’t handle the truth being exposed. Dread her. Run from her. Nurse Quinn still arrives. This is hilarious. Keep writing more articles!